Our ground floor practice in Hunmanby, between Scarborough and Bridlington is committed to the highest standards of professional healthcare in a friendly environment. You see the same faces each time you visit and we have many years of experience in dispensing spectacles so you can be confident that we will be able to help you with your eyewear. When you visit for an eye examination we will discuss your individual needs, examine your eyes thoroughly using modern equipment, answer your questions and offer you eyewear that meets your requirements. We provide a range of frames to suit all budgets, including designer frames, plus high quality spectacle lenses, sunglasses, accessories and items designed especially for children. We also offer a full range of packages for those who wear or would like to wear contact lenses. For specific work or leisure requirements we supply sportswear such as swimming goggles, ‘safety specs’ for those with a prescription and who need eye protection, and DSE screening. 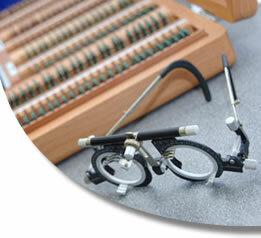 We welcome enquiries from employers and employees regarding eye care. A minimum standard of sight is required to drive a car and we can advise on whether you meet this. Our onsite workshop gives us the facility to offer an express service enabling you to collect your new glasses 24 hours from the time when you received your prescription.